At the start of the Bumblebee program one of the first tasks was to determine how the missile would be guided to the target. Some experiments with several different types of homing systems had already been done in the program that produced the SWOD-Mark 9 Bat anti-ship guided bomb, but these were all short range systems. Initial plans called for Talos to have a range of 20 miles, then it was extended to 50 miles, this was later extended to 100 miles, and then 130 miles. The methods for achieving long range guidance	and homing were unknown in 1945. The limited space available in the missile and the small antenna size also meant that the missile could not carry a transmitter powerful enough to illuminate the target at long ranges (active homing). 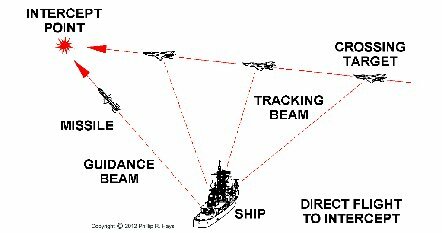 The target would have to be illuminated by the ship's radar and the missile would home on the signal reflected from the target (semi-active homing). The simplest homing method is to let the target tracking radar beam function as the guidance beam to steer the missile to the target. This works if the target is flying directly at the ship with little change in bearing. 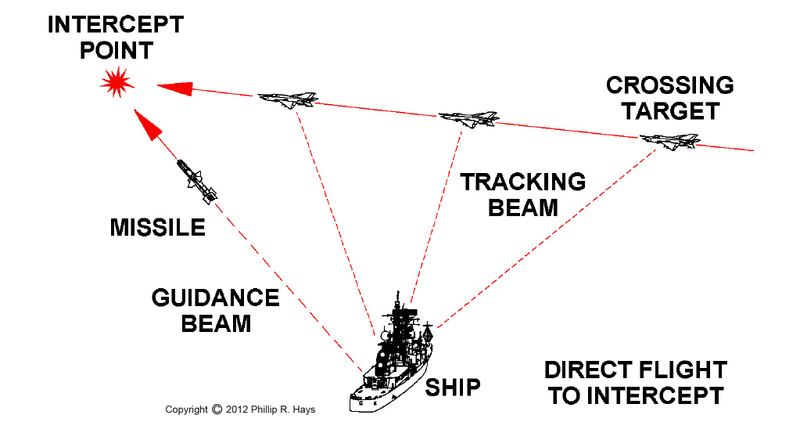 However, if it is a "crossing target" that is flying perpendicular to the line of sight to the ship with a high bearing rate, the intercept problem is more difficult. As the target angle changes the tracking beam must be rotated to keep pointing at the target. This causes the missile to fly a long curved trajectory that always falls behind the target, resulting in a tail chase. In this situation the missile can only close the target at a rate that is the difference between the speeds of the missile and target. If the target is as fast or faster than the missile there can be no intercept. Even if the missile is faster it may run out of fuel before it catches the target. More advanced versions of the tracking beam guidance scheme used "Proportional Navigation" to aim the missile ahead of the target, but the missile still had to remain in the tracking beam, causing it to fly an inefficient curving path to the target. To achieve long range intercepts the missile must use fuel efficiently and fly the shortest possible path to the intercept. The ramjet engine operated most efficiently at high altitudes. The most effective use of the missile was to launch it into a high altitude cruise and guide it to an intercept point ahead of the target. This required separate radar beams for target tracking and missile guidance. This scheme had the virtue that the two radars could be optimized to their respective tasks. A fire control computer used target position information from the tracking radar and missile position information from the guidance radar to calculate an intercept point, and then steered the guidance beam to deliver the missile to the target. At the start of the Bumblebee Program a test vehicle was needed to perform flight tests of beam riding control. Since a practical ramjet engine was not yet available a small subsonic rocket propelled Control Test Vehicle (CTV) was developed and flown in 1946.2 Flight tests were conducted at the China Lake test center near Inyokern, California. The XSAM-N-6 prototype Talos missile was flown from 1951 through 1954. XSAM-N-6W prototype nuclear armed Talos followed in 1953.2 In October 1952 the prototype Talos interferometer homing system succeeded in homing on a target and destroying it.3 The First Tactical Talos RIM-8A was introduced in 1955. Boundary layer temperature rise is a non-linear function of airspeed. To ensure shielding the sensitive electronics until the missile was sufficiently far away from the ship a metal alloy was selected with a suitable melting point chosen from a velocity-distance curve for the missile and booster. For example, assume that the missile would be at a safe distance from the ship when it is moving 1100 feet per second. A 90°F temperature rise occurs at about 1100 feet per second. If you assume an antenna cap temperature of 70°F at launch the temperature would rise to 160°F when the missile was moving 1100 feet per second. Woods Metal alloy of 50% bismuth, 25% lead, 12.5% tin and 12.5% cadmium has a melting point of 158°F,1 so it would be a good choice for the antenna caps. Note: I do not know for certain that the Talos antenna caps were this Woods metal alloy. Each ship's guidance transmitter generated a pulsed signal in the 5 to 6 GHz portion of the C band that consisted of groups of three pulses at short intervals followed by a relatively long period with no pulses. The pulse group repetition rate was not constant, but was varied according to the position around the conical scan. The beam rotated to sweep around the conical scan 30 times per second, clockwise with respect to the direction from the ship to the missile. The pulse rate was changed from 850 pulse groups per second to 950 and back to 850 each time the beam circled around the rotation axis. The maximum pulse rate was 950 pulse groups per second at the upper left scan position and the minimum was 850 pulse groups per second at the lower right, as viewed from the ship to the missile.10 This produced a 30 Hz sinusoidal frequency modulated (FM) signal that was the timing reference for the beamrider guidance system. An antenna on the tail end of the missile detected the guidance signal for the beamrider receiver. The output pulses from the receiver passed to a 30 Hz amplitude modulation (AM) detector and a 30 Hz frequency modulation (FM) detector. The missile compared the timing of the peaks of the amplitude signal (missile position) with that of the frequency signal (beam position) to determine the phase relationship. For example, if the AM peak occurred at the same time as the FM peak the missile was high to the left of the beam axis. If the AM peak occurred at the same time as the FM minimum the missile was low to the right. The phase relationship between the two signals determined which way the missile should steer to get back to the beam axis. The output of the phase detector was fed to circuits that derived the correct combination of wing motions to steer the missile to the beam axis. Talos used a similar scheme to fly the missile to intercept the target. 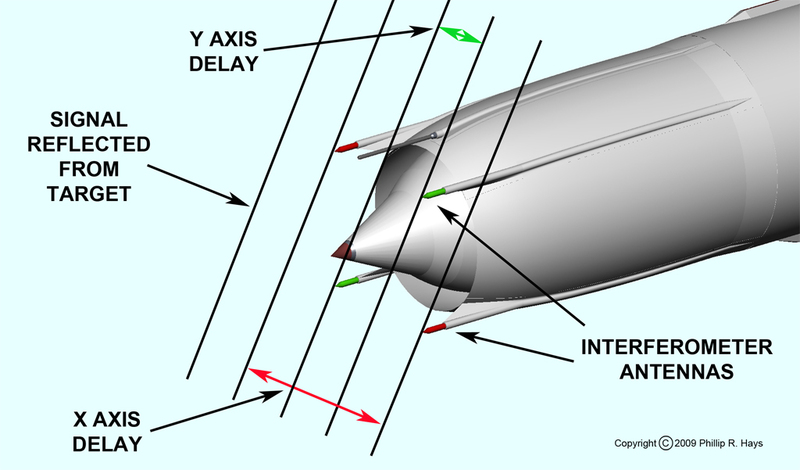 The missile did not aim at the target, it aimed at where the target would be at the time of the intercept, like the intersection of the two roads in the illustration. This produced the shortest, most direct flight to intercept, with the least maneuvering. 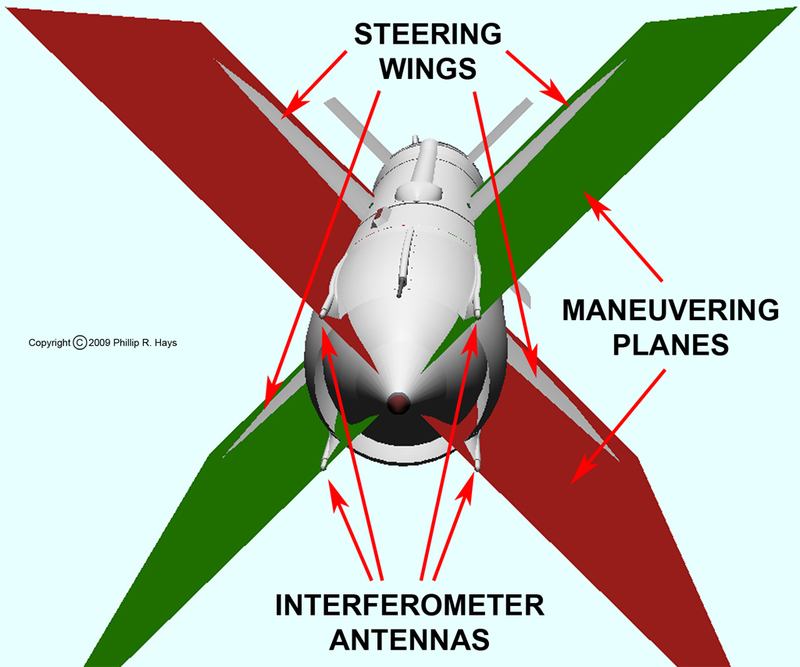 The interferometer used two pairs of antennas, each pair positioned in one of the missile maneuvering planes corresponding to a pair of steering wings. Each pair of antennas drove a control system to produce movement in the associated pair of steering wings. After the homing system was already in production for the RIM-8A First Tactical Talos missile a serious problem was discovered. Pulse seekers used range differences to discriminate targets and the pulse interferometer could not distinguish between two or more targets at the same range. Their reflections arrived at the interferometer at the same time and the signals were summed. 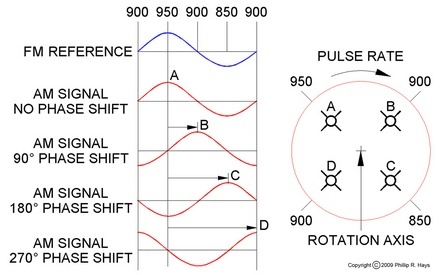 The phase shift mechanism selected the strongest signal which was the sum of the two signals and produced a bearing that pointed in a direction between the targets. As the missile approached the target group the distances to individual targets changed so the timing of the signals arriving at the interferometer changed. The interferometer generated a series of different bearings causing the missile to gyrate from one bearing to the next and fly between the targets.4 If the targets were a few hundred feet apart the missile would miss them all. Continuous wave (CW) seekers use velocity differences to distinguish targets.4 The Talos seeker was modified to use the Doppler effect to distinguish between multiple targets and ignore the background clutter. The AN/SPG-49 target tracking radars were modified to be able to produce both the high powered pulse mode tracking signal and a lower power continuous wave target illumination signal. During the homing phase about 15 seconds before intercept the AN/SPG-49 tracking radar on the ship began transmitting a continuous wave illumination signal along with the pulsed tracking signal. Each target in a group of targets moved at a different speed relative to the missile, even if they were at the same distance. Because of the relative motions of the missile and targets each target reflected a signal that was Doppler shifted slightly in frequency. This allowed the missile to distinguish between the targets and home on the appropriate target. 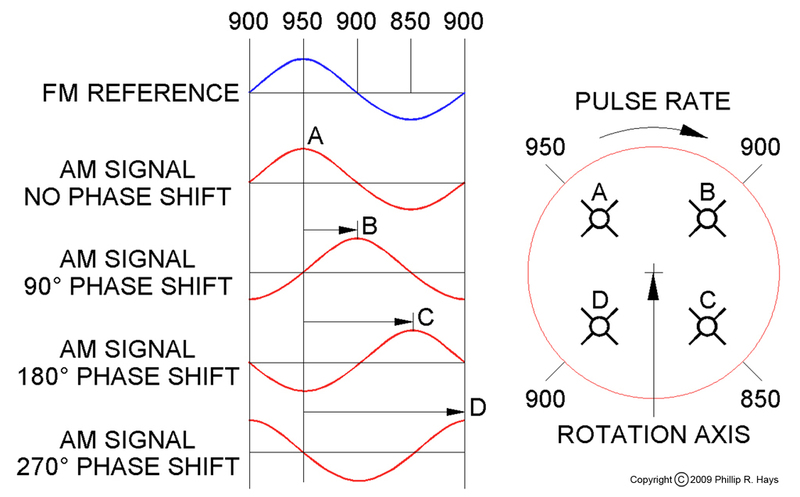 Doppler shift is a change of frequency due to the motion between the source and the observer. We experience this when a car, train or airplane passes close by. We hear the sound of the engine, horn or whistle change frequency when the vehicle passes us. When it is approaching the frequency is higher, producing a higher pitch. When it passes and is moving away the sound has a lower pitch. Multiple reflections were a problem for surface ship targets. The missile was moving at the same speed toward all parts of the ship , so multiple reflections with the correct Doppler shift were detected. As the missile to target range decreased the seeker began detecting reflections from several parts of the ship. The calculated target bearing shifted from point to point on the target causing the missile to maneuver violently in the last moments before intercept. This problem was solved by disabling the seeker shortly before intercept. 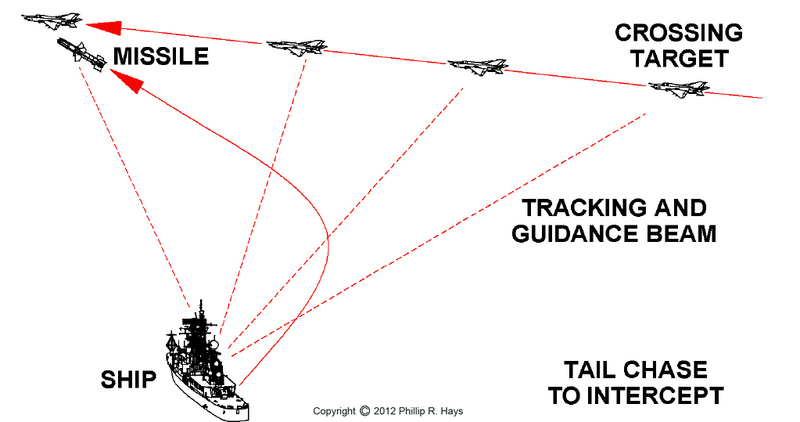 When a radar signal hits a target such as an aircraft or a ship, the reflections from multiple facets of the target can combine in strange ways. Sometimes this results in an apparent reflection point being outside the actual target, which can create a false intercept solution causing a missile to miss the target. This phenomenon is known as "glint". Glint is most evident in the plane of the target and transmitting radar. Because Talos dove on the target from above it was much less susceptible to homing errors caused by glint than missiles that flew at the same altitude as the target. The Talos ARM missiles were used to destroy North Vietnamese air control and antiaircraft radars. The USS Oklahoma City was the first ship to destroy an enemy radar with the Talos ARM missile. 1. Antenna Cap, Billy D. Dobbins, Angus C. Tregida and George W. Luke, Jr., U.S. Patent No. 2,998,943, September 5, 1961. 2. Evolution of the Talos Missile, William Garten, Jr. and Frank A. Dean, Johns Hopkins APL Technical Digest, Volume 3, Number 2, 1982, page 117. 3. The First Forty Years, Chapter 3, The Missile Age, Johns Hopkins University Applied Physics Laboratory, Schneidereith & Sons, Baltimore Md, 1983, page 19. 4. Guidance System, Robert L. Kent, Rosario S. Badessa, Carl Barus, Joseph M. Dunn, Raymond Arthur Glaser and Leonard B. Johnson, U.S. Patent No. 3,477,666, November 11, 1969. 5. Gunner's Mate M 3 & 2, Missile Guidance and Control, Naval Training Support Command, NAVTRA 10199-B, 1972, page 81. 6. Inter-ferometer Homing System, Joseph F. Gulick, Thomas D. Jacot, Harlan H. Knapp and Hilary H. Nall, U.S. Patent No. 3,181,813, May 4, 1965. 7. Power Modulator for Transmitter Beam Scan, William L. Vann, U.S. Patent No. 3,290,599, December 6, 1966. 8. Scanning Interferometer-Beam Rider Guidance System, Carl W. Brown, Allen B. Reppert, Bill D. Dobbins, U.S. Patent No. 3,677,500, July 18, 1972. 9. Talos Control System, Fletcher C. Paddison, Johns Hopkins APL Technical Digest, Volume 3, Number 2, 1982, page 154. 10. Talos Guidance System, Joseph Gulick, W. Coleman Hyatt and Oscar M. Martin, Jr., Johns Hopkins APL Technical Digest, Volume 3, Number 2, 1982, page 142. 11. The Talos Ship System, Elmer D. Robinson, Johns Hopkins APL Technical Digest, Volume 3, Number 2, 1982, page 162. 12. The Unified Talos, Frank A. Dean, Johns Hopkins APL Technical Digest, Volume 3, Number 2, 1982, page 123. Why do you swing the compass?